Robert D. Hales (1932-2017) was an apostle of The Church of Jesus Christ of Latter-day Saints. He died on October 1, 2017 soon after the morning fall General Conference session. He was 85. Hales, who spent four decades as a general authority, including 23 years as an apostle, passed away at 12:15 p.m. Senior apostle Russell M. Nelson and Hales’ family were at his side. He did not attend any of the fall conference sessions. Hales was married for time and eternity in the Salt Lake City temple to Mary, with whom he had two children. 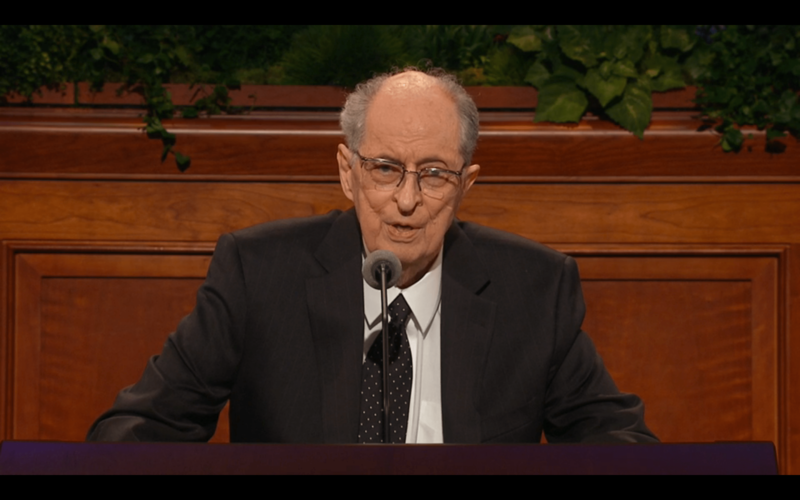 He was appointed to the First Quorum of the Seventy in 1976. In April 1994, Hales became an LDS apostle at the age of 61. Among his church positions before his appointments as a general authority were a first counselor in the Sunday School general presidency, president of the England London Mission, regional representative, stake president’s counselor, branch president (Spain), and was a bishop three different times (MA, IL, and Germany). With a background of growing up in New York, Hales played a vital role in having the Manhattan New York temple built and opened in 2002. Hales received a bachelor’s degree in business administration from the University of Utah and a MBA from Harvard. Hales was a jet fighter pilot with the U.S. Air Force and an executive with Gillette. He became president of Papermate and later became a vice president for Max Factor before becoming the CEO of Hughes Television Network. Hales left the business world in 1994 as the president of Chesebrough-Pond’s when he became an apostle. More than once Hales instructed his people to refrain from arguing about faith and avoiding “contention.” A common topic he enjoyed talking about was premortality. The general authority position held by Hales–apostle–may not be filled until next spring. Many are certain to speculate if this is the time for the LDS Church to put in a minority apostle, something that has never before been done. Meanwhile, President Thomas S. Monson also did not appear at conference, with many not expecting the leader to live until the next general conference. “Sometimes the adversary tempts us with false ideas that we may confuse with the Holy Ghost. . . . I testify that faithfulness in obeying the commandments and keeping our covenants will protect us from being deceived” (“The Holy Ghost,” Ensign, May 2016, pp. 105-106). “As we receive the inspiration of the Holy Ghost for ourselves, it is wise to remember that we cannot receive revelation for others. I know of a young man who told a young woman, ‘I’ve had a dream that you are to be my wife.’ The young woman pondered that statement and then responded, ‘When I have the same dream, I’ll come and talk to you’” (“The Holy Ghost,” Ensign, May 2016, p. 106). “Because that power resides in the Spirit of the Lord, we must never become contentious when we are discussing our faith. As almost every missionary learns, Bible bashing always drives the Spirit away. The Savior has said, ‘He that hath the spirit of contention is not of me’ (3 Nephi 11:29). More regrettable than the Church being accused of not being Christian is when Church members react to such accusations in an un-Christlike way!” (“Christian Courage: The Price of Discipleship,”Ensign (Conference Edition), November 2008, p. 73). “You and I were among those who used their agency to accept Heavenly Father’s plan to come to earth, to have a mortal life, to progress” (“To Act for Ourselves: The Gift of Blessings and Agency,”Ensign (Conference Edition), April 2006, p. 4). “In the premortal Council in Heaven, Lucifer rebelled against Heavenly Father’s plan. Those who followed Lucifer ended their eternal progression—be careful who you follow!” (“If Ye Love Me, Keep my Commandments,”Ensign (Conference Edition), May 2014, p. 35). “Jesus is a God, yet He continually distinguishes Himself as a separate individual being by praying to His Father and by saying that He is doing His Father’s will” (“Eternal Life—to know Our Heavenly Father and His Son, Jesus Christ,”Ensign (Conference Edition), November 2014, p. 81). “All of us on earth are winners because we chose to come to this mortal probation, which Alma described as a preparatory state” (“The Aaronic Priesthood: Return with Honor,”Ensign (Conference Edition), May 1990, p. 39). “Surely our Heavenly Father is saddened – and the devil laughs – when we contentiously debate doctrinal differences with our Christian neighbors” (“Christian Courage: The Price of Discipleship,” Ensign (Conference Edition), November 2008, p. 73). “Each of us has been sent to earth by our Heavenly Father to merit eternal life” (“Personal Revelation: The Teachings and Examples of the Prophets,” Ensign (Conference Edition), November 2007, p. 87).